Even before the new team reached the island we had achieved a lot. Four of us, Sarah the Director, Charlotte the Curator, and Vickie and Kerstin the Museum Assistants, travelled down together from Brize Norton military airport. In the Falklands we attended a ‘meet and brief’ session with the South Georgia Government, GSGSSI, at Government House. The new Commissioner, Nigel Phillips, popped in to say hello and was able to formerly handover an artefact that had arrived at Government House for the South Georgia Museum. 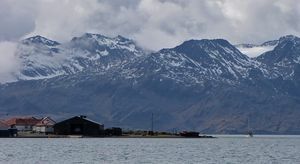 It was a gavel that had been found in what is believed to have been the old manager’s house at Grytviken, now our museum, so it is returning home. The gavel is well worn, so one wonders what events it may have presided over whilst in use. Calling to attention a noisy meeting of whaling officers, or a bigger audience at a prize giving in the church perhaps, or maybe at more serious events, though surely those would have been dealt with by the Magistrate who was in residence at KEP. 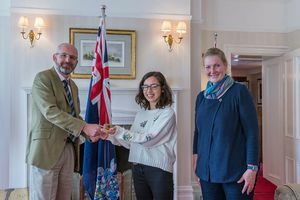 We also met with our colleagues at the Falkland Island Museum, and collected several important Shackleton-related artefacts that have been on loan to them for the past year. Then it was time to board the Fishery Patrol Vessel Pharos SG for the voyage to the island. 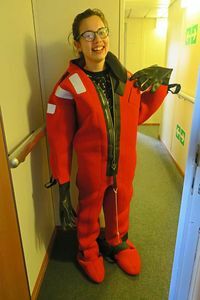 Charlotte gamely tried her survival suit on for the safety briefing - not a fashionable picture! Once back on land it was flat out to biosecure tonnes of cargo. 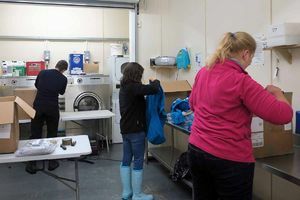 Not just shop stock, but curatorial materials, cleaning materials and boxes and boxes of loo rolls and even a bicycle! Our home was already cosy thanks to Bob and others from KEP turning on the boilers and water before we arrived home, and even baking a couple of loaves of bread and a cake –“Thanks Steve”. 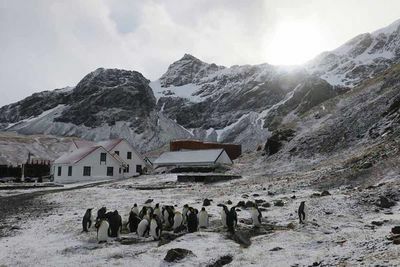 There was a different sort of welcome committee when we walked over to the staff bunkhouse (known to all by its old nickname Drukken Villa); a group of moulting King Penguins. We arrived on October 13th. Pat, who will be working with us when he is not busy with the SGHT Habitat Restoration Project, was off aboard the tiny Wanderer 3 yacht with Thies and Kicki a couple of days later for the start of the Habitat Restoration Phase Four – setting out monitoring devices to detect if rodents are present in any of the areas aerially baited in phases Two and Three. There were already several charter yachts about, and just a week later we had our first cruise ship of the season, Ushuaia. 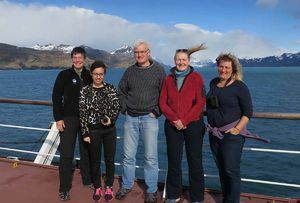 The ships have been coming regularly since so we were very glad to see the final member of our team, Dani the volunteer Fundraising Assistant, who arrived on the NG Explorer on November 1st. There is lots of training yet to be done: how to respond to the fire alarm; medical first response; even how to work out postage for goods being sent out to our “internet shoppers”, but now we are all here, we can really get going. This page was last modified 13:28, 13 November 2017. This page has been accessed 4,225 times.